While this new development might be hectic for us window and doors companies, we admit that this is probably the most interesting thing we’ve read all week. Interesting enough to make us write an article about it, for sure. Recent news sources picked up on developments and Michigan University, which suggest that a new generation of solar cell technology is a few years away from hitting the market. What does this mean for windows and doors? Read on below. This new generation of solar panels is here, though, meaning they could soon be used instead of glass as viable replacements to any object reliant on a transparent surface. According to an article in Newsweek, the solar cells will start to hit commercial products over the next few years. What does this mean for your home? Well, consider how much light hits your windows and doors daily. What if this energy could be harvested and used to power your home? Windows that power my home? That’s crazy! Yes, we agree. The scientist team behind this solar cell project state that they’ve hit milestones in recent weeks and the technology is “making sense to scale up.” This system works by picking up near infrared wavelengths, and guiding them onto photovoltaic solar cells. While the efficiency of these solar cells is lower than your typical, non-transparent kind, the team behind the project expects to see a tripling in improvement over the upcoming years. As solar energy becomes more affordable, we see increased use worldwide in homes and private residences. Even people living in apartments are installing solar panels on their balconies to improve their living space’s energy efficiency. Experts believe that sooner or later easy access to solar power, easy integration into home and quickly improving energy storage capacity will lead to complete coverage of the country’s clear window panes, and steady coverage of the United State’s and Canada’s growing energy demands. The hope for this technology is that ultimately, windows will be installed with these solar panels outright. That is why, we personally hope for this future, and for the possibility that improvements to clear solar panel technology within window panes will lead to world access to inexpensive, widespread solar energy and a sustainable future. And we’re not just saying this because it’s window related, we promise. 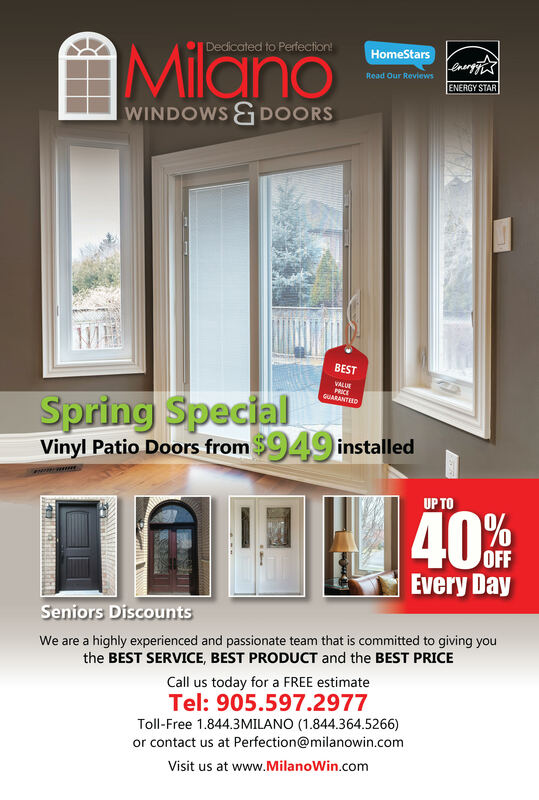 Milano Windows and Doors is your number one choice for window and door installation in Toronto. Vaughan, North York, Richmond Hill, Maple, Newmarket, Mississauga, Scarborough, Brampton and further. We provide customers with environmentally friendly, energy efficient window and door products, as well as quick, effective and timely installations. Our company specializes in window and door installations and repairs. We stock and install high-quality window and door products such as vinyl windows, steel and fibreglass entry doors, interior doors, porch enclosures and patio doors. We guarantee your complete satisfaction with our services, personally surveying all jobs performed by our teams to guarantee the proper installation techniques and amazing design. Contact our company today for energy-efficient window and door products, as well as style advice and ideas from the expert window and door installation professionals. Browse through our product catalogue now, or visit our website to learn more.